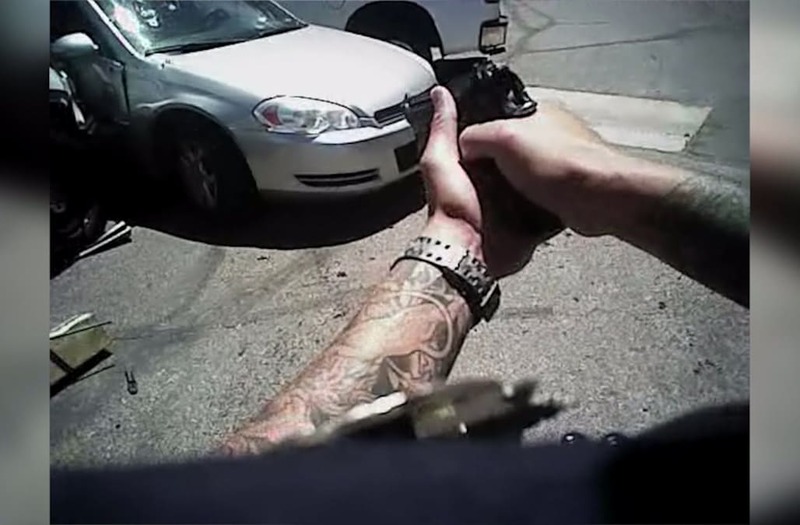 DENVER (KDVR) -- Body camera video from an officer-involved shooting over the summer is renewing questions over the amount of force used against the suspect. On June 18, Keith Roberts was reportedly seen driving around Denver waving a rifle out of his window. According to arrest documents, Roberts led police on a chase, sometimes reaching speeds in excess of 80 mph. He lost control near the entrance to an apartment complex in Aurora where his mother lived. One of the Denver Police Department officers rammed the suspect’s car and witnesses said they began shooting at him almost immediately. Body camera video from a June 2017 officer-involved shooting is renewing questions over the amount of force used against the suspect. “I heard them say put your hands up and then I was less than five seconds,” a neighbor said. The two officers shot at least 27 rounds. Eight of the bullets hit the suspect. “This is another case of an overreaction and a gross use of excessive force,” said Roberts’ attorney, Jason Flores-Williams. A rifle was found within arm’s reach inside the suspect’s vehicle. The DA’s report said there is evidence one bullet might have been fired from the weapon, but it is unclear if that happened during the incident or before police contacted him. “I find that both officers reasonably believed that officers’ lives and the public were in imminent danger," the report concluded. However, Flores-Williams believes the officers engaged in what’s known as “contagious shooting," which he says is not legal. “Police officers, because they hear or think they hear or see another police officer firing their weapon, they join in,” Flores-Williams said. It is not clear who the officer is referencing. The other officer is heard saying, “I can’t see, I can’t see,” after discharging his weapon. He told investigators there was sun glare preventing him from clearly seeing the suspect through the windshield. “Instead of acting responsibly, they are simply reacting based upon what’s happening around them and that’s how people die,” Flores-Williams said. Roberts survived the shooting. He will stand trial beginning Jan. 22 for the charges he is facing from the day of the shooting. Flores-Williams said they are using the excessive force accusations as his defense.